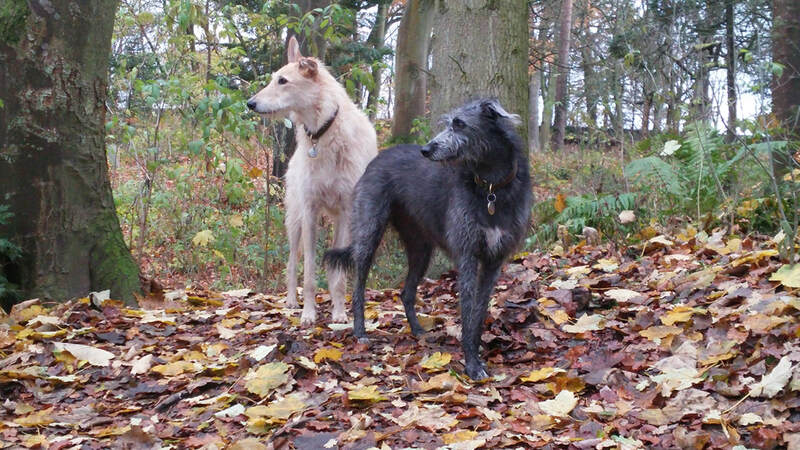 ​Originally from the State of Virginia, U.S.A., I came to the UK in 1980 and 15 years ago settled in the beautiful Scottish Borders where I live with my partner and our three wonderful girls: Lucy our 8 year old Deerhound x Greyhound Longdog, Brodie our 6 year old Lurcher and Trinket a cheeky little Whippet puppy. ​I’ve worked in a lot of different types of jobs including 12 years working in the area of domestic abuse. I spent a lot of time working directly with women experiencing abuse and training people to understand how domestic abuse affects women and children. Dogs aren’t human but they share many of the effects of abuse that people experience and often carry the ghosts of the past throughout their life. This is why I feel it is so important that we treat our dogs with kindness and raise them with compassionate guidance. I first started studying dog behaviour in 2008 gaining my first diploma in 2010. I feel it is crucial to continue with professional development by learning new skills and keeping up with the latest developments in canine behavioural science. Therefore, I continue my training by attending courses, conferences and seminars, as well as reading newly published researched papers and lots of books - I have over 100 books on canine training and behaviour in my library! I am proud to be part of a new way of thinking about dogs that respects them for their amazing abilities and which doesn’t promote using fear or cruelty in training them. In 2014 I applied to train as a tutor for Puppy School and in 2015 started my company Braw Puppy which includes holding the Puppy School franchise in the Scottish Borders. I am one of only 3 Puppy School tutors in Scotland. In being involved with Puppy School, I feel very privileged to be part of a network of people who support positive and kind techniques in teaching both puppies and people move toward helping puppies to become well-adjusted adults. Getting your puppy started on the right foot is the most important thing you will ever do for its future. I think it’s really important to help people understand puppy behaviour and how to teach their puppy to be socially acceptable while building strong relationships without overwhelming them. The more of us that guide our puppies with kindness toward becoming confident adults, the better it will be for all of society, and the fewer dogs we will see in shelters, showing aggression, or considered socially unacceptable. I am committed to using only positive training methods because I believe that harsh methods are damaging to a dog’s mental well-being and make bonding with your dog more difficult. Dogs are wonderful but sensitive creatures that deserve our understanding and compassion. Treat your puppy well and you will have a devoted companion because nothing is stronger than the trust you can build with your dog – a trust that must be earned by you and never taken for granted.